While some of you may think that lifestyle marketing is a recent phenomenon, Porsche has been offering hip car-related apparel and accessories since the 1950s. In fact, the Porsche Design moniker celebrated its 40th anniversary in 2012. Each year the company cranks out all sorts of interesting, stylish lifestyle products which can be purchased both online and from their flagship retail stores. Current offerings include everything from sunglasses and luggage to bicycles and toys for kids. We were lucky enough to get our hands on a few items from the Motorsports Collection as part of the Porsche Driver’s Selection. The collection includes t-shirts, jackets, mugs, caps, a keystrap, notepad, watch and umbrella. Our care package of new releases features a men’s t-shirt, flexfit baseball cap, mug and windbreaker. 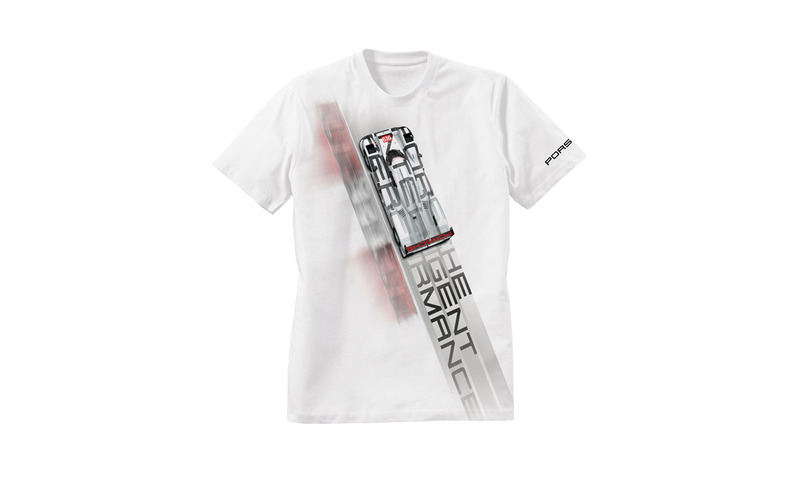 The Racing Collection Men’s T-shirt displays an edgy image of the original Porsche LMP1 car. Offered in white 100% cotton, it retails at $59.00. The shirt is well-constructed with a nice heft and the screening is almost perfectly blended into the fabric with only a slight amount of print discernible to the touch. It comes nicely folded and packed into a rectangular sleeve which gives it a cool aesthetic, particularly as a gift. The shirt shrank only slightly in its initial laundering and there was no fade to the screen print. The Racing Collection Flexfit Baseball Cap is constructed of 84 % nylon, 14 % cotton, 2 % elastane. Available in white for a modest $39.00, the hat is pleasantly stretchy and the one- size-fits-all approach makes the selection process painless. I typically wear a 7 1/4 and the cap fit perfectly, neither too snug nor too loose. This is the first baseball cap I’ve had in white and, while it’s not a color I would typically opt for, it definitely keeps your noggin cool in the unrelenting SoCal sun. The Racing Collection Mug is made of white bone china and showcases the color, logo and branding of the LMP1 racecar. 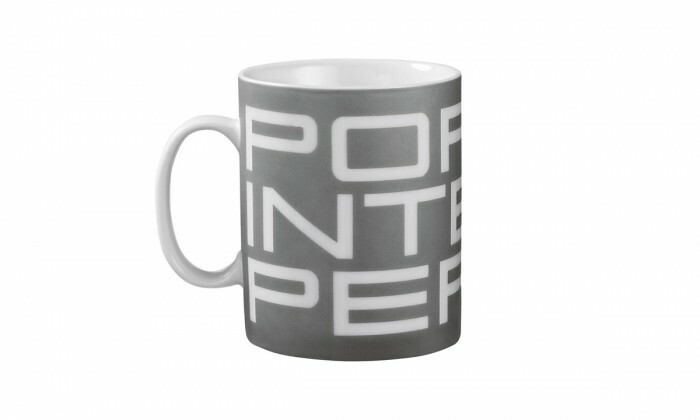 It features matt metallic print glazing and is dishwasher safe for a retail price of $29. The size is actually perfect for sipping tea or coffee– not so small that you’re constantly jumping up to refill it or so big that finishing its contents becomes an unwelcome burden. It’s also sturdy enough to withstand a few bangs and clanks. 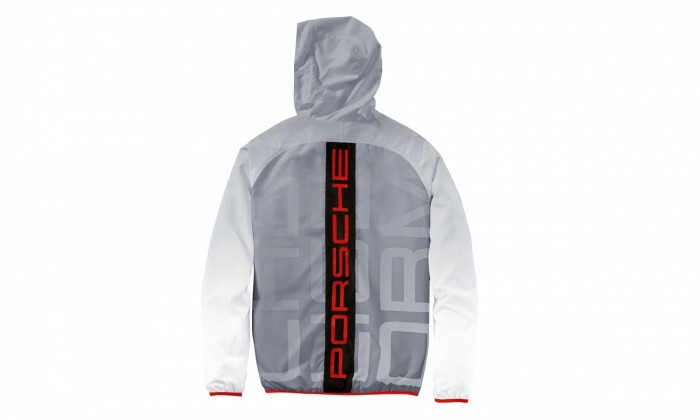 The Racing Collection Unisex Windbreaker jacket is similar to other items in the collection and also features branding from the LMP1 racecar. 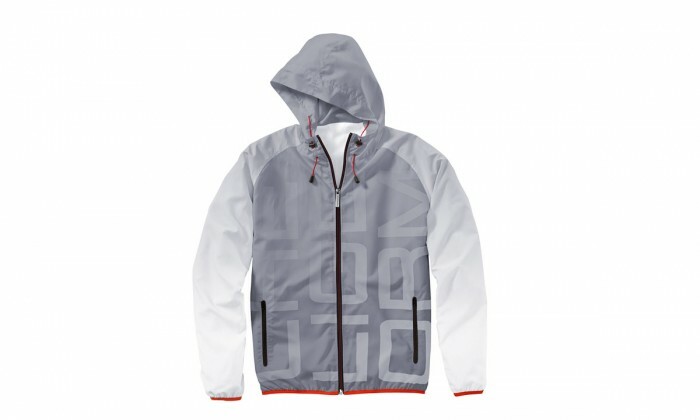 Made from 100% polyester, the main body is dark gray (as is the hood) while the sleeves have a gradient that blends gently from light gray to white. Red accents complete the look. The windbreaker, which retails for $159, is lightweight but sturdy enough to offer a good amount of protection from the elements. It has an ultra-modern, clean and sleek aesthetic which I dig. The elastic on the bottom hem and the sleeves keeps everything neat and tucked. Overall, the Racing Collection is a solid offering. You want enough branding to show off the Porsche name but not something that’s going to slap people across the face. The designs are clean, relatively understated (by comparable standards) and have a progressive, high-tech look and feel. 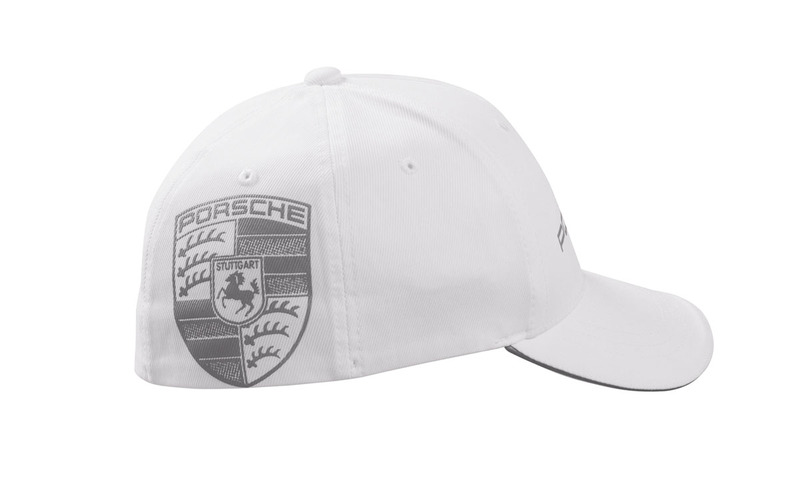 I’m not one for walking around with a lot of branding but I definitely feel quite comfortable (okay, cool…) sporting items from the Porsche Driver’s Selection.